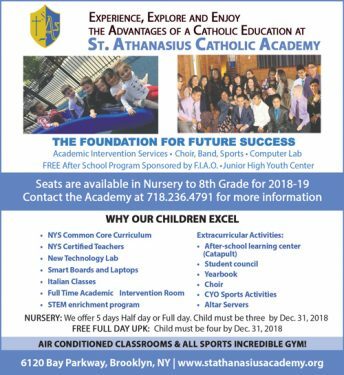 St. Athanasius Catholic Academy’s mission is to provide an atmosphere where students’ intellectual abilities and talents are fully developed. Through various experiences, it is the Bensonhurst academy’s conviction to enable students to encounter Christ in every aspect of their lives. There are opportunities to encourage students’ creativity, responsibility, scholarship, leadership and citizenship. Building a cooperative partnership with both family and community ensures a caring and safe environment. As a Catholic academy, St. Athanasius’ most outstanding quality is its Catholic identity. It is the underlying theme in all that happens each day. In words and actions, the school community teaches and lives the ways of Jesus Christ, the Master Teacher, to all who enter its doors. The student body prays together through morning prayer, decades of the Rosary and dedication to saints. The school attends Mass, prayer services in classrooms and church, and special events centered on the faith formation of the students. Priests conduct weekly classes for students and are very present to the children every day. Offering grades nursery through eight, St. Athanasius Catholic Academy, serves children from Brooklyn, Staten Island and even Queens. The school excels because it has strong, dedicated teachers, priests and staff. The academy follows New York State Common Core standards, with New York State-certified teachers. The facility also has a new technology lab, SMART Boards, laptops, a full gymnasium, auditorium and outdoor recreation area. All classrooms are air conditioned. The school offers free full-day pre-kindergarten, Italian, art, a full-time academic intervention room, Title I services five days a week, SETSS teachers, speech intervention services, two school psychologists and a guidance counselor. Students also learn the importance of giving service. The student council collects food for the parish food pantry. They also visit the local hospitals as part of their service projects.